I was staying in Risikesh hoping to improve my health but instead I have become a little weaker. Now I have come back to my home, Vrindavana. If anything should go wrong, at least I will be here in Vrindavana. At Srila Prabhupada's request, kirtanas by a group of no more than four or five devotees and Bhagavatam readings went on constantly, whether he was in his room, on the veranda, or on the roof. In the morning from five to ten and in the evenings from three to nine he would sit with his eyes closed, absorbed in the kirtana. 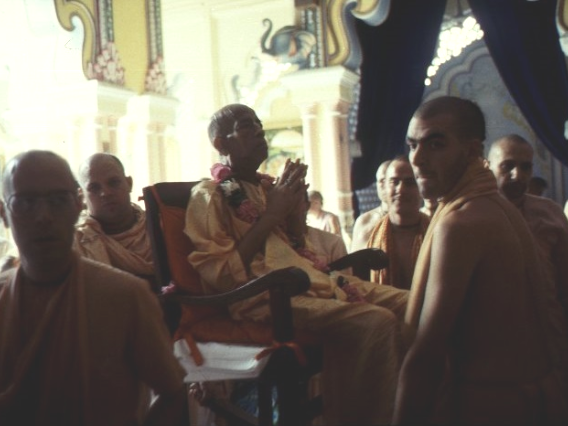 Prabhupada was concerned that his movement continue securely, with all ISKCON properties in the possession of his disciples within the institution and all his instructions made clear for the future. These matters should be dispatched now in a will, and the G.B.C. men should gather in Vrindavana to make these last arrangements and to be with him. Once these things were settled, Prabhupada would be free to continue writing his books with no worries. One morning Srila Prabhupada asked to go and see the Deities, and his men promptly moved him in his rocking chair before Krishna-Balarama. Sitting in his chair beneath the tamala tree, Prabhupada looked up at the transcendental brothers, while many tears glided down his cheeks. "They are dressed very nicely," he said. While he basked in the presence of Krishna and Balarama, he enjoyed the soothing shade of the tamala tree. "The contractor wanted this tree cut down," he said, "but I would not allow. There are not many tamala trees left. These worldly men do not know." During the course of the monsoon months Srila Prabhupada met with his disciples from the Bhaktivedanta Institute and guided them in arranging for an international conference of scientists in Vrindavana titled, "Life Comes From Life." He also inspected the gurukula building. Meeting with his disciple Ambarisa Dasa, the great-grandson of Henry Ford, Prabhupada discussed the model for a Vedic planetarium based on the Fifth Canto of Srimad Bhagavatam. "I am afraid of a big conspiracy," he noted while receiving reports about the Mayapur temple being attacked by a gang of three hundred dacoits. The local newspapers were giving reports on Srila Prabhupada's health, and a genuine concern for his well-being prevailed throughout Vrindavana and surrounding villages. Many arrived to have darshana of Srila Prabhupada. Despite protestations from many wellwishers, Srila Prabhupada—although physically weak—resolved to go to the West to preach and inspire his disciples by his presence.